Poila Boisakh 1426 Celebrated on 14th April, 2019. Founded in 940 by the great monk Kancho-Shigo, Naritasan Shinshoji temple is the head temple of the Shingon sect of Buddhism. More than 2 million visitors come to pray at Narita san during the first three days of the Japanese New Year. 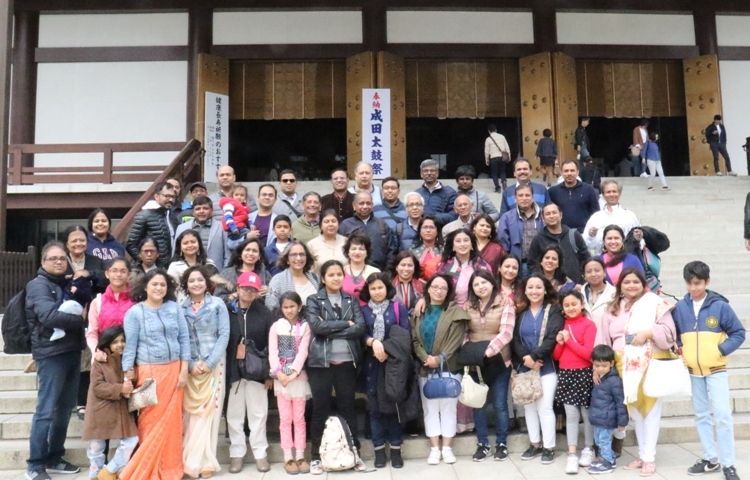 Keeping in tune with this Japanese tradition, BATJ organized a trip this year to Narita san for celebration of our Bengali New Year (1426 Poila Boisakh). We were sixty (60) people in our group this year. The temple authorities made arrangement for us to be seated and offer prayers during their special Goma (homa) ritual. After this, a lunch was hosted for us at the temple's banquet room by Mrs. Hashimoto, wife of the senior most priest of the temple. A senior member of the temple gave welcoming speech and toast with sake was raised (very traditional way of welcoming the new year by the Japanese with rice wine) wishing everyone good health and happiness in the New Year. We were served with a very special Japanese vegetarian temple lunch and everybody enjoyed the food. Also a very special event called 'drum festival or the taiko matsuri' was taking place at the temple precincts that day. It is one of the largest festivals in the region held once a year. Our sincere thanks to Mrs. Emiko Kothari and Mrs. Hashimoto for making all the arrangements and we all had a memorable day together. 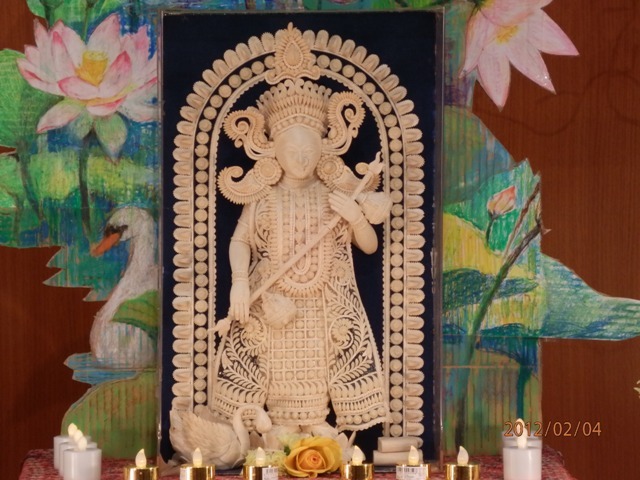 Saraswati Puja on 9th February, 2019. Saraswati Puja (oldest community Saraswati Puja held in Tokyo since 1981) was organized by BATJ on 9th February, 2019 at the Otakuminplaza Basement Hall in Tokyo. This was the 39th year for BATJ celebrating Saraswati Puja in Tokyo. Mr. Sudeb Chattopadhyay performed the Puja. Children and their parents jointly prayed for another year of success to the Goddess of Learning and offered Anjali. This year, one tiny tot had Hate Khori after the Puja. The chief guest was H.E. Mr. Sanjay Kumar Verma, Ambassador, Embassy of India, Tokyo. Mr. Verma was accompanied by his wife Mrs. Gunjan Verma and an welcome speech was delivered by Mr. Ranjan Gupta on behalf of BATJ. Mr. Verma also delivered a short speech and after that a flower bouquet was presented to Mrs. Verma by Mrs. Rita Kar on behalf of BATJ. He was also presented with a copy of our annual Anjali magazine published in 2018 by Mrs. Keiko Chattopadhyay. Ambassador's welcoming event was conducted by Mr. Partha Kumar. After prosad and lunch - catered by Priya Restaurant- our annual talent show was held. Teenagers and adults put up a wonderful performance. Afterwards, we had Antakshari in which there were 22 participants in 11 pairs (husband and wife pairs included) followed by a short quiz session conducted by Swami Medhasananda Maharaj. After Arati, snacks catered by Moti Restaurant was served in the evening. Although it was a day with forecast for heavy snow, the weather could not dampen our spirits. As always, it was a very enjoyable day for all, especially for the kids with a day of only play and no studies. 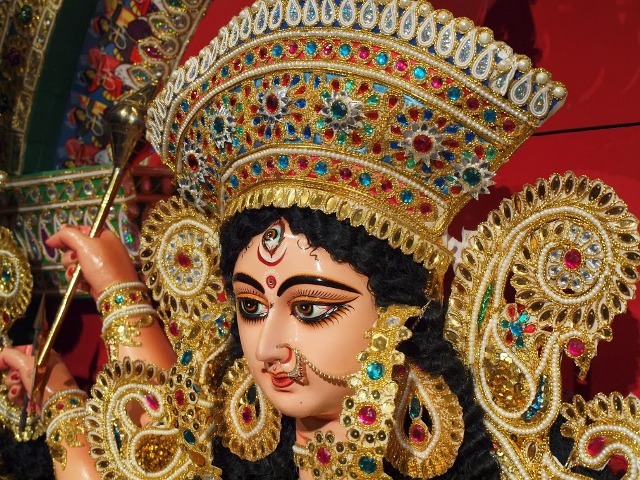 Durga Puja on 21st October, 2018. This year we celebrated our 29th year of Durga Puja in Tokyo (oldest community Durga Puja organized in Tokyo since 1990) , along with the publication of Anjali. Puja was held at the Main hall of Ota Kumin Plaza facility in Ota ward, Tokyo. Anirban Mukherjee performed the puja, and it was attended by well over three hundred people. The Deputy Chief of Mission, Indian Embassy in Tokyo, Mr. Raj Kumar Srivastava, and other dignitaries graced the occasion with their presence. The DCM released the Anjali magazine and delivered a short speech after which a flower bouquet was presented to the DCM by Mrs. Rita Kar on behalf of BATJ. This year's cultural program started with Durga Vandana, followed by Sax Jazz by Nishant Chanda and his friends, Folk Beats of India which included dance and songs from various states of India performed by BATJ members young and old as well as Natyanjali Online group members, Odissi Performance by Kazuko Yasunobu and members of Studio Odissi, and Japanese and English pops by Reimi Dasdeb and group. The day ended with Devi Baran, Sindur khela and dancing to the beats of the dhak and finally dinner followed by adda as usual. Both lunch and dinner was served by Priya Restaurant. This year on May 19, Swami Vivekananda’s 155th birth anniversary celebration was organized by the Celebration Committee in collaboration with Nippon Vedanta Kyokai, Zushi (a branch of Ramakrishna Mission) at Minami Otsuka Hall in Toshima-ku, Tokyo under the guidance of Swami Medhasananda, President of Nippon Vedanta Kyokai. 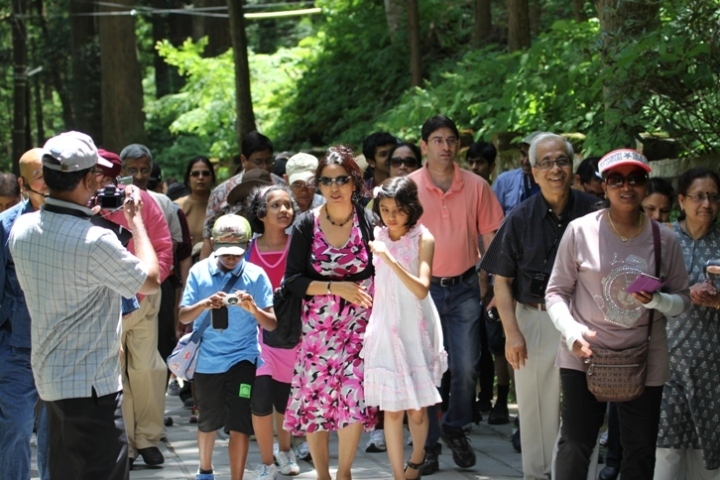 This year also marked the 125th year of Swami Vivekananda’s only visit to Japan. Many of our Bengali Association of Tokyo, Japan (BATJ) members participated and helped in making the program successful. 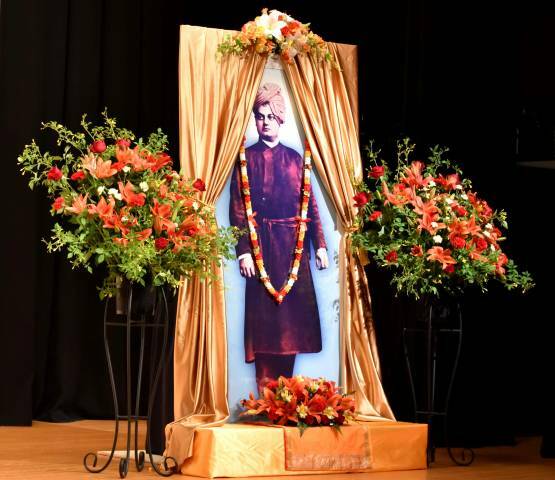 The program started at 1:30 p.m. with Vedic prayer and offering of flowers to Swami Vivekananda’s photo. Mr. Raj Kumar Srivastava, Deputy Chief of Mission, Embassy of India, Tokyo, Prof. Fukunaga Masaaki, Visiting Fellow, Sophia University and Swami Medhasananda gave speeches on the theme of “India-Japan Relationship”. This was followed by a recess when refreshment was served and after that, the cultural program started. BATJ group members (Biswanath Paul, Chaitali Paul, Tuli Patra, Kalapi Roy, Meeta Chanda, Rita Kar, Samudra Datta Gupta, Sanjib Chanda, Sayantani Dasgupta, Sutapa Bhattacharya, Sangeeta Krishnamoorthy, Amit Roy, Alarka Kundu, Debjani Ray, Pamela Maiti and Masanori Hisamoto (Tabla) performed several devotional songs, which was followed by devotional songs by the Japanese group led by Ms. Shanti Izumida, in collaboration with members of Yoga School Kailas. The last part of the cultural program was classical dance performed by the Mayuka’s Indian Classical Dance Group. The whole program ended at around 4:30 p.m.
Rabindra jayanti was organized by BATJ on Saturday, May 12, 2018 to commemorate the 157th birth anniversary of Kobiguru Rabindranath Tagore. The function was held at the Ikegami Kaikan, Ota-ku, Tokyo. The program started with welcome address from Mr. Ranjan Gupta on behalf of BATJ, which was then followed by the chorus of “Hey nuton..” sung by our local talents, and a group dance choreographed by Ms. Subha Kokubo Chakraborty and performed by our local talents young and old. We then had three guest speakers who spoke on the relevance of the celebrations in light of Kobiguru’s connections with and reflections on Japan. The speakers were Ms. Muanpuii Saiawi, Counsellor, Embassy of India, Tokyo, Swami Medhasananda, President, Nippon Vedanta Kyokai, and Mr. Tom Kawai, Secretary General of Kampo-Tagore Association, and President of Tagore 150 Japan. Our Japanese friends then delighted us with songs, recitation, and dance. Ms. Yuka Okuda led the songs and recitation, and the dance was choreographed and led by Ms. Sukrishna Ishii. Ms. Tomoko Kambe, who had previously organized such events for a long period in Japan, sang two songs in Japanese, her own translation of Tagore compositions. The renderings of our Japanese friends captivated the audience. We then enjoyed Tagore songs sung in Hindi by Ms. Sayantani Dasgupta, Ms. Sutapa Bhattacharya, Ms. Meeta Chanda, and Ms. Rashmi Gupta. This was followed by two patriotic songs delivered by Ms. Muanpuii Saiawi and Ms. Manjistha Roy. Mr. Ranjan Das then delivered the vote of thanks on behalf of BATJ. The final part of the program was Rituranga – ode to the seasons. Here, the recitation was delivered by Ms. Ajanta Gupta, Mr. Ranjan Gupta, Mr. Biswanath Paul, and Ms. Purnima Ghosh, with songs by Mr. Samudra Datta Gupta, Sayantani Dasgupta, and Manjistha Roy. On accompaniment we had Ms. Yuka Okuda on Tanpura and Mr. Masanori Hisamoto on Tabla. Dance was performed by Ms. Subha Kokubo Chakraborty and her students, Ms. Sumana Kar, Ms. Arpana Mitra, Ms. Sudipta Bhawal and the dance group led by Ms. Emi Mayuri. The master of ceremonies were Ms. Keiko Chattopadhyay and Mr. Brajeshwar Banerjee. The whole program was coordinated by Ms. Rita Kar. It was the first time that BATJ had organized Rabindra Jayanti at such a grand scale, and by all standards it was a pleasure for both the audience and BATJ participants. In all, about 300 guests and BATJ participants attended the event. We thank all our friends for their participation and look forward to their presence in the future as we hope to organize such events in the future with valuable support from our Japanese friends. Saraswati Puja on 21st January, 2018. Saraswati Puja (oldest community Saraswati Puja organized in Tokyo since 1981) was organized by BATJ on 21st January, 2018 at the Otakuminplaza Basement Hall in Tokyo. This was the 38th year for BATJ celebrating Saraswati Puja in Tokyo. Anirban Mukherjee performed the Puja. Children and their parents jointly prayed for another year of success to the Goddess of Learning and offered Anjali. This year, two tiny tots had their Hate Khori after the Puja. The Ambassador of India was represented by Mr. Avnish Sharma, Minister (Consular). Mr. Sharma delivered a short speech after which a flower bouquet was presented to him by Mrs. Keiko Chattopadhyay on behalf of BATJ. After prosad and lunch - catered by Priya Restaurant- our annual talent show was held. Teenagers and adults put up a wonderful performance. A dance recital by Subha Kokubo Chakraborty capped the events. Instead of the usual Bingo at the end we had Antakshari in which there were 12 participants in 6 pairs (husband and wife pairs included). After Arati, snacks catered by Moti Restaurant was served in the evening. As always, it was a very enjoyable day for all, especially for the kids with a day of funfilled activities and no studies, of course. Durga Puja on 30th September, 2017. This year we celebrated our 28th year of Durga Puja in Tokyo (oldest community Durga Puja organized in Tokyo since 1990) , along with the publication of Anjali on the theme of "60th anniversary of Cultural Collaboration Agreement between Japan and India." 2017 is being celebrated by Govt. of Japan and Govt. of India as the "Year of Japan India Friendly Exchanges". Embassy of India, Tokyo designated BATJ Durga Puja as part of the exchanges and allowed us to use the official logo in our Anjali Magazine. Puja was held at the multi-purpose hall of Otabunkanomori facility in Ota ward, Tokyo. Sudeb Chattopadhyay performed the puja, and it was attended by well over three hundred people. The Ambassador of India His Excellency Mr. Sujan Chinoy, and other dignitaries graced the occasion with their presence. The Ambassador released the Anajli magazine and delivered a short speech after which a flower bouquet was presented to the Ambassador by Mrs. Rita Kar on behalf of BATJ. The highlight of this year's cultural program was traditional dance and music from Ladakh, performed by members of Northern Arts and Cultural Society of India. We also had the opportunity to enjoy music performed by Bangla Band (comprising local fathers), and a dance and music tribute to Salil chowdhury, with dance performed by our young and old talents accompanied by songs by the ladies. We also enjoyed Rabidrasangeet from Manjistha Roy, and instrumental music interlude, capped with Japanese and English pops by budding talents from our community. The day ended with Devi Baran, Sindur khela and dancing to the beats of the dhak and finally dinner followed by adda as usual. Both lunch and dinner was served by Priya Restaurant. Saraswati Puja on 5th February, 2017. Saraswati Puja was organized by BATJ on the 5th of February, 2017 at the Otabunkanomori Hall in Tokyo. This was the 37th year for BATJ celebrating Saraswati Puja in Tokyo. Sudeb Chattopadhyay performed the Puja. Children and their parents jointly prayed for another year of success to the Goddess of Learning and offered Anjali. This year the Ambassador of India was represented by Mr. Avnish Sharma, Minister (Consular). Mr. Ryuko Hira, President, Indian Chamber of Commerce & Industry was also present. After prosad and lunch - catered by Priya Restaurant- our annual talent show was held. Teenagers and adults put up a wonderful performance. This year a new attraction of the cultural program was a lively performance of Rajasthani folk dance by a Japanese group (Leader, Ms. Coco Ayumi). The audience was captivated by the rhythmic performance presented in colorful costumes. Snacks catered by Moti Restaurant was served in the evening. As always, it was a very enjoyable day for all, especially for the kids with a day off from studies with special permission from the Goddess of Learning. Durga Puja on 8th October, 2016. 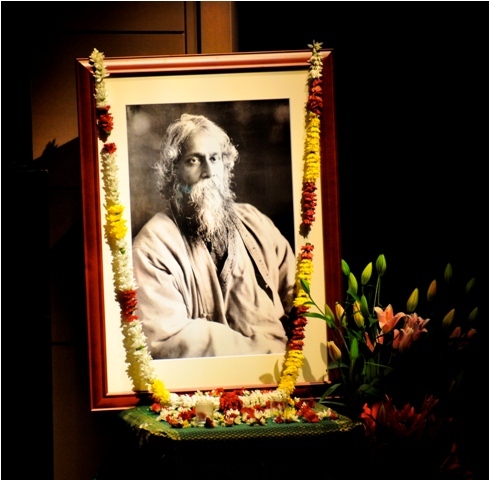 This year we celebrated our 27th year of Durga Puja in Tokyo, along with the publication of Anjali on the theme of "Rabindranath Tagore's maiden visit to Japan", commemorating the 100th year of the Nobel laureate's first visit to Japan in 1916. Puja was held at the multi-purpose hall of Otabunkanomori facility in Ota ward, Tokyo. Sudeb Chattopadhyay performed the puja, and it was attended by well over three hundred people. The Ambassador of India His Excellency Mr. Sujan Chinoy, and other dignitaries graced the occasion with their presence. The Ambassador released the Anajli magazine and delivered a short speech after which a flower bouquet was presented to the Ambassador by Mrs. Manjulika Hanari on behalf of BATJ. The highlight of this year's cultural program was Songs rendered by renowned Rabindrasangeet exponent Mrs. Pramita Mallik, with Mr. Masanori Hisamoto on the tabla, and accompanied by dance by Ms. Shubha Kokubo Chakraborty. We also had the opportunity to enjoy a dhunuchi dance performed by the fathers and sons from our community, in addition to dance rendered by our local budding talents, instrumental duet on Japanese koto and keyboard, solos on saxophone, and devotional songs performed by our adult members. The day ended with Devi Baran, Sindur khela and dancing to the beats of the dhak and finally dinner followed by some relaxing adda. Both lunch and dinner was served by Priya Restaurant. Poila Boisakh 1423 Celebrated on 16th April, 2016. This year also BATJ bengali new year celebration took place in the form of a bus trip. This time we visited the famous city of Chichibu in nearby Saitama prefecture. It was just two days after the actual noboborsho and we all enjoyed the occasion very much. About 50 people from 22 families participated in this day-long trip. We visited three places of interest in the city, Shibazakura Park, Imamiya Shrine, and Meisen (Silk) Museum. The bus picked up the members from two stops, one at Yokohama at 7:00 AM and another near Tokyo station at 8:00 AM. There was no guide this time but in the bus the members had a good round of adda punctuated with melodious songs from our members young and old as we moved from one destination to the next. After reaching the scenic Shibazakura park (Hitsujiyamakoen), the members freely walked around for an hour enjoying the riot of colors in shibazakura (moss phlox) covering the gentle slope of the hill inside the park. Then we had lunch at Traghetto, an Italian restaurant in Chichibu city. Here we had a decent meal of salad, spaghetti and pizza. After lunch we went to the Meisen museum, where the museum guide explained in Japanese the history and significance of the unique way of creating Meisen silk designs. Next we went to the Imamiya shrine which is a shinto shrine dedicated to the worship of the Izanagi/Izanami (the gods who created Japan), Susanou, Hachidai-Ryuo (Eighth Dragon Kings) and Benzaiten (Saraswati). The head priest explained the history of the shrine in English along with a concise brochure he prepared specially for us. It was a good opportunity to learn how closely Shintoism is related to worship of Mother Nature. On our way back we spent the time listening to delightful songs from participants, young and old, capping a memorable day. Saraswati Puja on 13th February, 2016. Saraswati Puja was organized by BATJ on the 13th of February, 2016 at the Otabunkanomori Hall in Tokyo. This was the 36th year for BATJ celebrating Saraswati Puja in Tokyo. Sudeb Chattopadhyay performed the Puja. Children and their parents jointly prayed for another year of success to the Goddess of Learning and offered Anjali. This year the Ambassador of India H.E. Mr. Sujan R. Chinoy graced the occasion. He gave a splendid speech highlighting Hindu traditions and explaining the similarities with Japanese ones. The speech was uploaded to YouTube by the Indian Embassy in Tokyo ( https://www.youtube.com/watch?v=bC7TIalobng ). 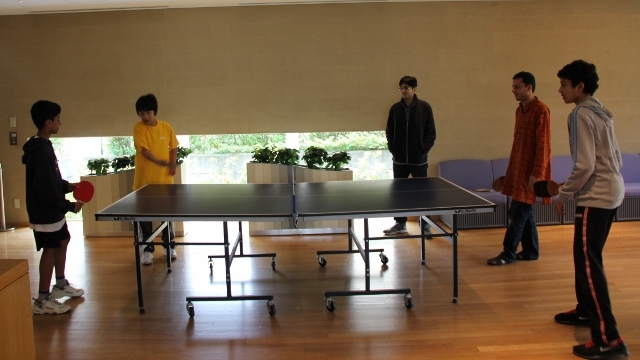 After prosad and lunch - catered by Priya Restaurant- our annual talent show was held. Toddlers to teenagers and adults put up a wonderful performance. This year also Bingo was organized after the cultural program. Snacks catered by Moti Restaurant was served and it was time to wind up after a very enjoyable day. Durga Puja on 17th October, 2015. This year we celebrated our 26th year of Durga Puja in Tokyo, along with the publication of Anjali on the theme of "Peace", commemorating the 70th year of Japan's peaceful contribution to the world after the end of the Second World War. Puja was held at the multi-purpose hall of Otabunkanomori facility in Ota ward, Tokyo. 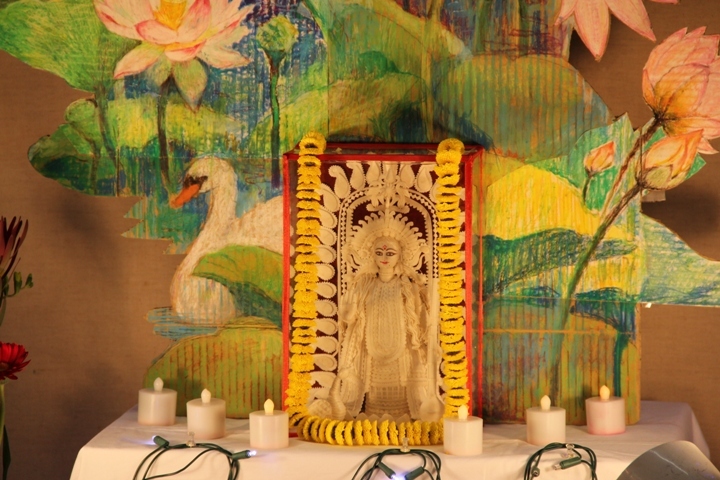 This year Sudeb Chattopadhyay performed the puja, and it was attended by well over three hundred people. The Ambassador of India Her Excellency Ms. Deepa Gopalan Wadhwa, Ambassador of Nepal His Excellency Mr. Madan Kumar Bhattarai and other dignitaries graced the occasion with their presence. BATJ presented the outgoing Ambassador of India with "Tanter Sari and Kantha Swal" farewell gift as a token of gratitude for all her warm and generous support of our cultural activities throughout her tenure in Tokyo. This year's cultural program was an eclectic mix of Indian classical music, Indian classical and Japanese folk dance, a comedy drama based on the Ramayana, along with entertaining song and dance renderings by our local talents, young and old. Ms. Baby Karmakar, First Secretary of Bangladesh Embassy performed some beautiful religious songs. Pandit Ravindranath Vempati, Yoga teacher from the Indian Embassy, entertained us with his melodious flute. The dance program “Nrityanjali” was performed by an international mix of talents under the direction of Ms. Shubha Kokubo Chakraborty. The day ended with Devi Baran, Sindur khela and dancing to the beats of the dhak and finally dinner followed by some relaxing adda. Both lunch and dinner was served by Priya Restaurant. 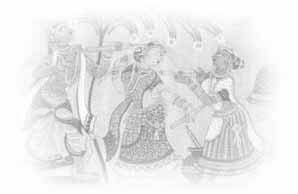 Poila Boisakh 1422 Celebrated on 30th May, 2015. This year BATJ bengali new year celebration took place in the form of a bus trip to the famous historic city of Takasaki in nearby Gunma prefecture. It was late in May, but we all enjoyed the occasion very much. About 50 people from 20 families participated in this day-long trip. We visited two places of interest around Takasaki city, Haruna Shrine, and Takasaki Daruma Temple. Our tour operator was Vaishali Travels of Tokyo. The owner, Mr. Manmohan (Rampi) Sahni accompanied us as guide. 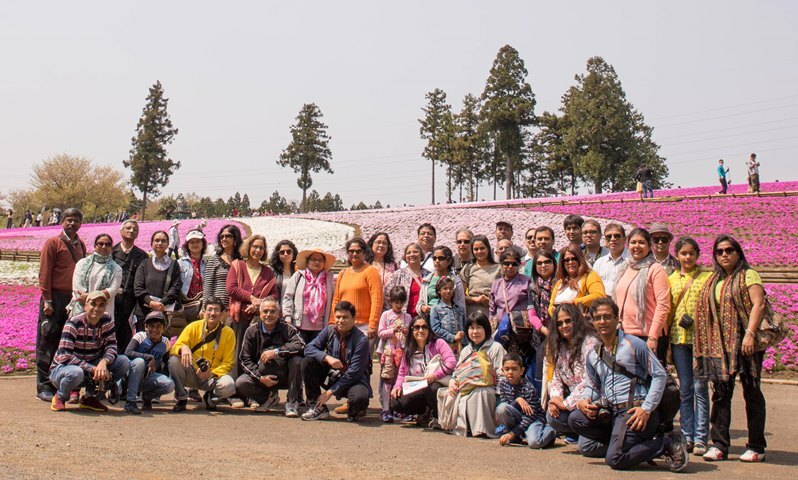 His witty narration about the places of interest around Takasaki city punctuated with melodious songs in Hindi & Japanese made sure that all the participants enjoyed the trip to its fullest extent. He was ably assisted by Mr. Bhuwan Tewari in this regard. The bus trip started at 8:00 AM from a place near Meguro station. Thanks to Mr. Byomkesh Panda, owner of Priya restaurant, complimentary breakfast bento was served in the bus. After reaching the historic Haruna shrine, we were shown around by a volunteer Japanese guide, accompanied by translation into English by Rampi-san. Then we had lunch at Sapkota, a Nepali restaurant in Takasaki city. Here we also had the pleasant surprise of delicious cake served to celebrate Amartya's (son of Anirban & Shrabani) birthday. After lunch we went to the Daruma temple, where the head priest explained in Japanese the history and significance of the unique Japanese custom of using Daruma dolls to pray for wishes to be fulfilled. It was a pleasure to learn that Daruma was actually a priest of Indian origin. We then went to a place where the Daruma dolls are actually made. The owner of this shop demonstrated how the dolls are painted with delicate brush strokes. Many of the participants bought Daruma dolls as souvenirs at this shop. On our way back we spent the time listening to delightful karaoke songs from participants, young and old, capping a day full of fun and joy. Saraswati Puja on 24th January, 2015. 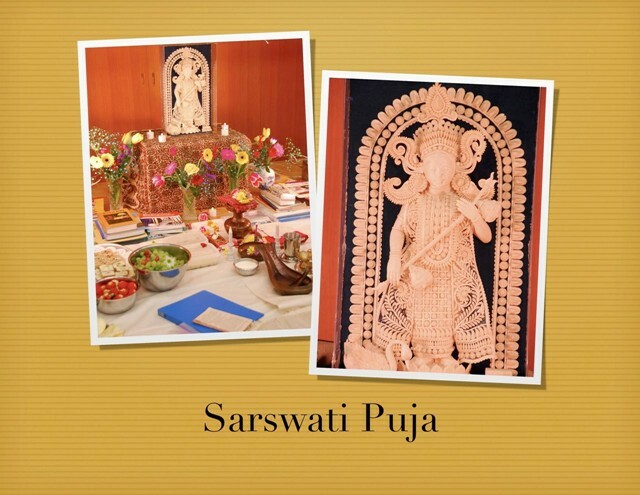 Saraswati Puja was organized by BATJ on the 24th of Jnauary, 2015 at the Otakumin Plaza Hall in Tokyo. Anirban Mukherjee performed the Puja. Children and their parents jointly prayed for another year of success to the Goddess of Learning and offered Anjali. After prosad and lunch - catered by Priya Restaurant- our annual talent show was held. Toddlers to teenagers and adults put up a wonderful performance. Next was another big attraction - The Bingo was organized after the program. The Ambassador of Nepal H.E. Dr. Madan Kumar Bhattarai and his wife graced the occasion and the Ambassador of India was represented by Mr. A. Ramu, Councellor. Snacks catered by Moti Restaurant was served and it was time to wind up after a very enjoyable day. 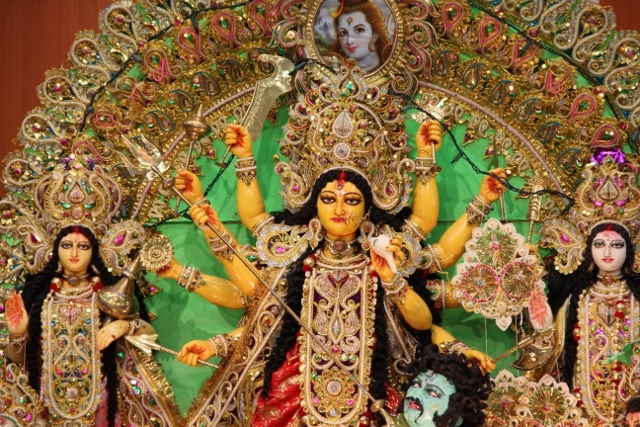 Durga Puja on 4th October, 2014. 2014 was a very special year for BATJ as we celebrated our 25th year of Durga Puja in Tokyo, with a special edition of Anjali and slideshow of Durga Puja in general with emphasis on our 25 years of celebration in Tokyo. Puja was held at the auditorium of Ota Kumin Plaza and this year Anirvan Mukherjee performed the puja. Lunch was donated by Priya Restaurant and was attended by over three hundred and fifty people. The Ambassador of India Her Excellency Ms. Deepa Gopalan Wadhwa, Deputy Chief of Mission Mr. Amit Kumar, Ambassador of Nepal His Excellency Mr. Madan Kumar Bhattarai and other dignitaries graced the occasion with their presence. This year's cultural program was a mix of Indian classical, modern, Bollywood, Western and Japanese music and dances. The main attraction of the program was the dance performance by Kalakhshetra - the most renowned Bhratnatyam dance school from Chennai, India - facilitated by ICCR and Embassy of India, Tokyo. This was also very exceptional in a way as it was the opening event of the year long Festival of India in Japan initiated by Prime Minister Narendra Modi during his visit to Japan. The day ended with Devi Baran, Sindur khela and dancing to the beats of the dhak and finally the dinner. 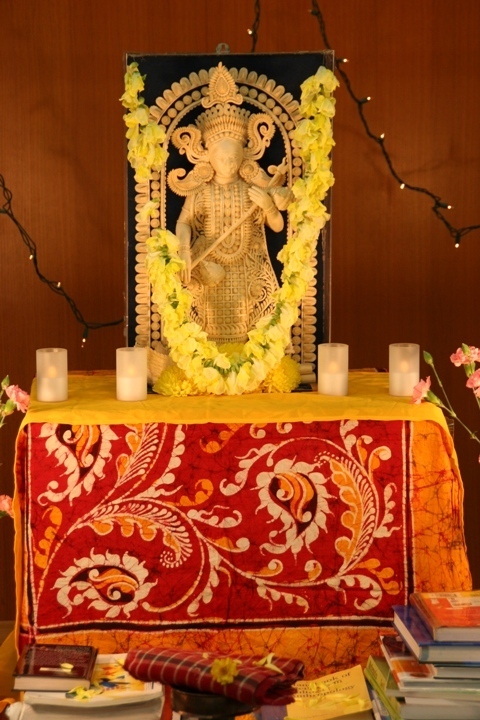 Saraswati Puja on 1st February, 2014. Saraswati Puja was organized by BATJ on the 1st of February, 2014 at the Otakumin Plaza Hall in Tokyo. Sudeb Chattopadhyay performed the Puja. Children and their parents jointly prayed for another year of success to the Goddess of Learning and offered Anjali. After prosad and lunch - catered by Priya Restaurant- our annual talent show was held. Toddlers to teenagers and adults put up a wonderful performance. Next was another big attraction - The Bingo was organized after the program. The Ambassador of Nepal H.E. Dr. Madan Kumar Bhattarai and his wife graced the occasion and the Ambassador of India was represented by Mr. A. Ramu, Councellor. Snacks catered by Moti Restaurant was served and it was time to wind up after a very enjoyable day. 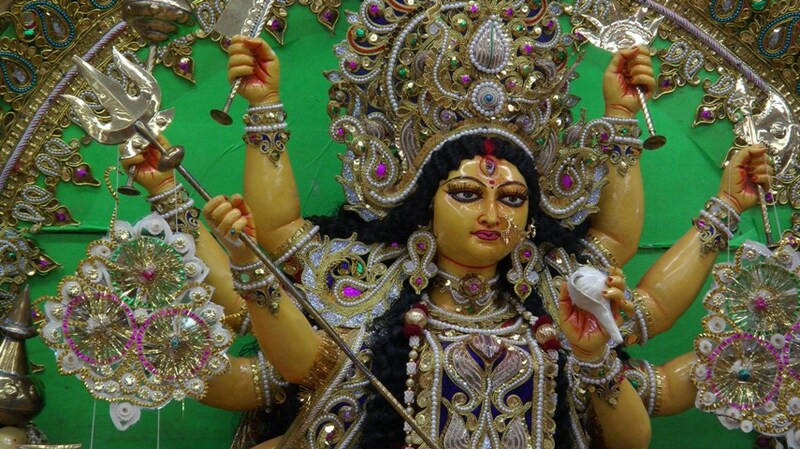 Durga Puja on 12th October, 2013. Durga Puja was held by BATJ on the 12th of October, 2013 at the Kawasaki Shimin Plaza hall. This year, a new idol of Durga, sculpted by Amarnath Pal, was brought from Kumartuli, Kolkata. Swami Medhasanda of Ramkrishna Mission, Japan released the special issue of our annual magazine “Anjali �Ededicated to Swami Vivekananda’s 150th birth anniversary. Sudeb Chattopadhyay performed the Puja and Puspanjali. After prasad and lunch distribution, we had our cultural program. This year’s theme was the Rhythms of India, where we had our ladies to the tune of Garba and the men joining in the vibrant Bhangra. The adults, the teens as well as the children contributed to the rhythms with singing, dancing and playing music on the piano as well as the koto. Tokyo Weekenders, a Tokyo based music group delighted the audience with their beautiful songs and music. Seraikella Chau dance by Guru Shashadhar Acharya and his troupe from India was our last program. The day ended with Arti, sindur khela, dance and dinner. Poila Boisakh 1420 on 20th April, 2013. Poila Boisakh 1420 was celebrated at the Recreation Center of the Yokohama Institute for Earth Sciences. The center has all that needs to make a day memorable - community room with kitchen where the ladies were able to prepare snacks with drinks, tennis courts, plenty of open space for all to enjoy, and certainly we made the most of it. This facility was arranged by Dr. Prabir Patra through his office. After lunch rains forced everyone indoors but the time was well spent with bingo, singing, dancing, tea, and "adda". Saraswati Puja on 23rd February, 2013. 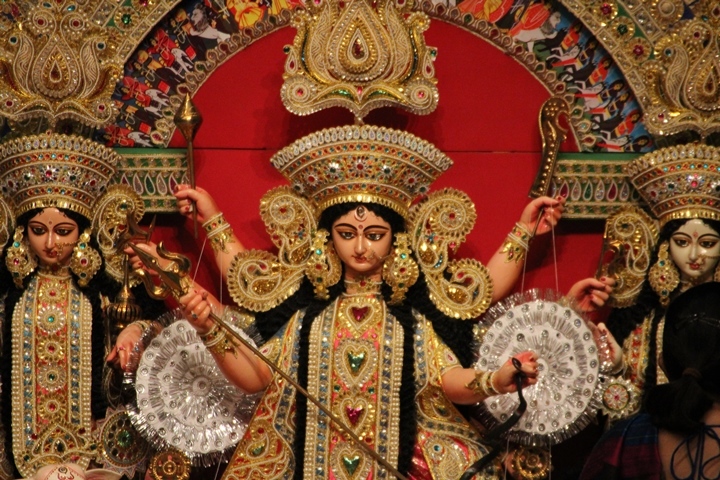 Durga Puja on 20th October, 2012. 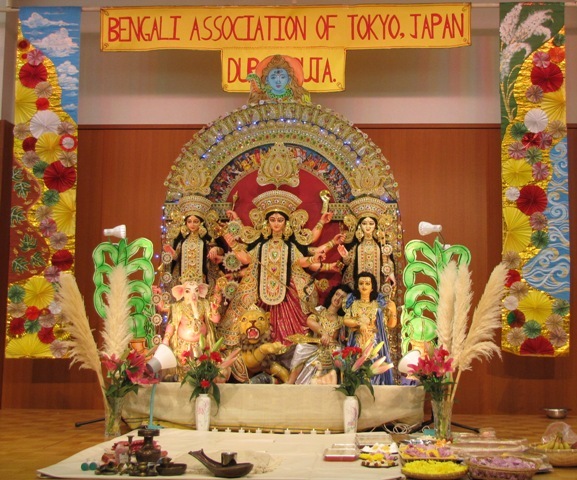 The 23rd Durga Puja in Tokyo was celebrated by the Bengali Association of Tokyo, Japan on the 20th of October, 2012. Ambassador of India, H.E., Mrs. Deepa Gopalan Wadhwa graced the occasion by her presence during cultural program in the evening and addressed the audience. Anirban Mukherjee performed the puja which was followed by Anjali, Prasad and Bhog. Our editorial team had again come up with an impressive publication of “Anjali�E The cultural program, was commendable too. The audience enjoyed “Abak Jalpan�Enbsp;and folk dances by the children as well as the other musical events of the evening. The program ended with a beautiful rendition of Mahisasurmardini by a visiting Chau dance group from Purulia. The day’s festivities ended with Arati, Sindur khela and dinner. 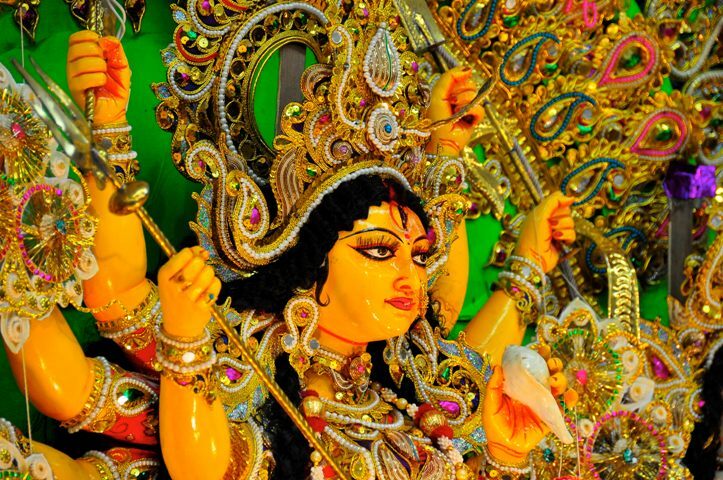 Click here for 2012 Durga Puja Photos. Poila Boisakh 1419 on 14th April, 2012. Saturday with the kind consent and help from Swami Medhasananda. We all gathered at noon and Maharaj led us all in prayers and meditation. Together we all chanted "Asato ma sadgomayo". This was followed by lunch. After lunch and some adda, we were directed to the new Annex of the Mission where we watched a video on making of Belur Math and it was followed by evening tea and snacks. And then, it was already time for Sandhaya Arati and some devotional songs by members.Dinner followed, and we were ready to head home after a very nicely spent day at the Ashram. Saraswati Puja on 4th February, 2012. Saraswati Puja was organized by BATJ on the 4th of Feb., 2012, at the OtaBunkanomori hall in Tokyo. Swami Medhasananda ji of Vedanta Society of Japan performed the puja & prayers and then guided our tiny tots through their initiation to learning "Hathe khori" . After prosad and lunch - catered by Priya Restaurant- we had our cultural program.This year we had a special performance by Mr. Christopher Blasdel, author, renowned artist and exponent of shakuhachi, the Japanese flute. It was a wonderful afternoon of music, dance, recitation and also story telling by the children who performed in the Children's Talent Show. There was a very entertaining magic show by Mr. D to wind up the program. Tea and snacks catered by Moti restaurant was served and this brought us to the end of the day. 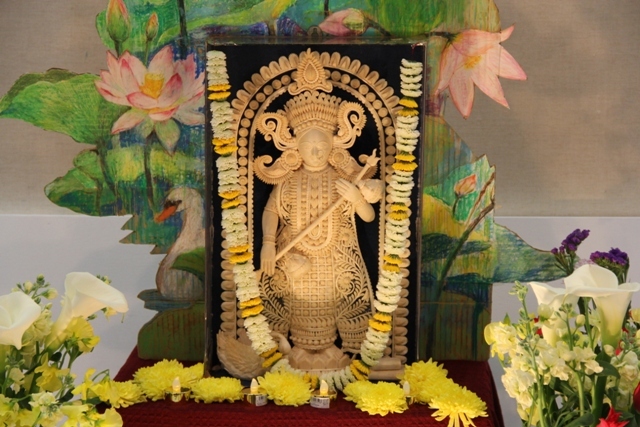 Click here for 2012 Saraswati Puja Photos. Durga Puja on 8th October, 2011. Durga Puja 2011 took place in Tokyo on the 8th of October, at the Ota Bunkanomori Hall. Anjali, our annual magazine was published with a dedication to the Great East Japan earthquake of March 11. Puja was performed by Sudeb Chattopadhyay, followed by Anjali, prosad and bhog. All the rituals of the morning over, it was time for the cultural program. The children put up a fine show with songs, dances and two short plays from Sukumar Roy, Hingshuti and Pagla Dashu. The Tokyo Bangla Band, our very own band, performed really well and keeping up with them the ladies sang the Japanese song �E/span>Furusato�E/span>, or Hometown, remembering all the people who have lost their homes and unable to return to their hometown due to the earthquake, tsunami and also the nuclear disaster. This was followed by a wonderful composition of dances based on Odissi style by the Japanese dance group, Studio Odissi. The final event of the program was a superb performance by the Baul and Fakirs of Nadia, presented by banglanatok.com, group from India. Evening Arati, sindur khela, dance with dhak music and dinner concluded the day, with the chants of �E/span>Asche bochor abar hobe�E/span> and wishing all a Subho Bijoya. Saraswati Puja on 12th February, 2011. 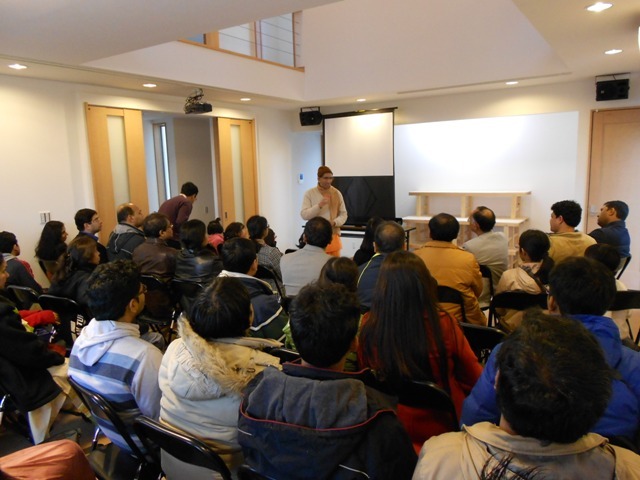 Saraswati Puja was organized by BATJ on the 12th of Feb., 2011, at the Ota Bunkanomori hall in Tokyo. Sudeb Chattopadhyay conducted the Puja and led us all in the Anjali and then guided our tiny tots through their "Hathe khori". After prosad, we had khichuri lunch catered by Priya Restaurant and soon after that, we had our cultural program. It was a wonderful afternoon of music, dance, recitation and also story telling by the children who performed in the Children's Talent Show. An incredible amount of effort put in by the children. Congratulations to all of them. This was followed by a remarkable presentation of dances by "Natyamanjari" , a Japanese Bharatnatyam group, led by Emi Mayuri. They also presented two dances based on Rabindrasangeet. After evening Puja, it was time to clean up, have tea and snacks and bid adieu. 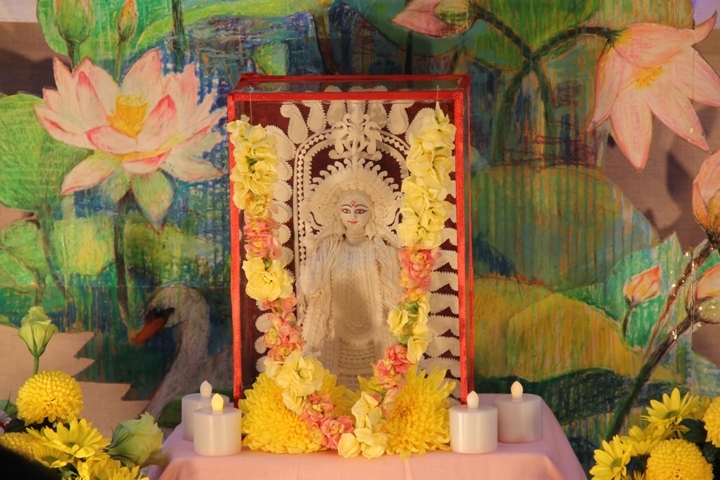 Click here for 2011 Saraswati Puja Photos. Durga Puja on 16th October, 2010. 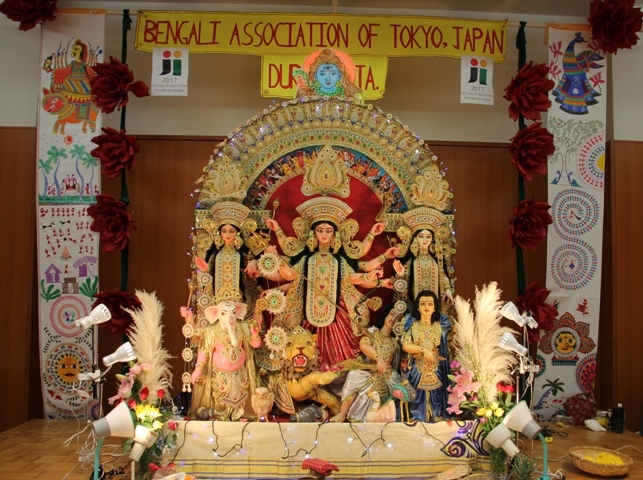 The 21st Tokyo Durga Puja organized by the Bengali Association of Tokyo, Japan was held on the 16th of October, 2010 at the Ota Bunkanomori hall. Our annual Puja publication “Anjali�E dedicated to Rabindranath Tagore’s 150th Anniversary, was published that day followed by Puja, performed by Sudeb Chattopadhyay, Anjali, Prosad and Bhog. This year’s cultural program was partially dedicated to Rabindranth Tagore.Yuka Okuda, who had studied music and Rabindrasangeet at Santiniketan rendered some beautiful songs. The children performed Oscar Wilde’s “Selfish Giant�Ein which Rabindranath Tagore’s songs and poems were weaved in to form an enchanting musical. Members of the community presented eternal love songs and contemporary dance and “Park Street�EBangla Band by our very own boys rocked the audience. There was a brilliant performance of Odissi Dance by Tridhara group from India that was led by Guru Gajendra K. Panda, courtesy of the Indian Embassy. The day ended with evening Arti and sindur khela and dancing, followed by dinner. Rabindra Jayanti on 25th April, 2010. BATJ has been organizing their Rabindra Jayanti for the past few years, but the 149th Birth Anniversary of Gurudev was a big success, thanks to the tireless enthusiasm and hard work by some of our members. On April 25th at the Funabori Tower Hall the children presented Tasher Desh, followed by Tagore songs, poems and music performed by members of the community in Bengali, English, Hindi, and Japanese. Rendition of Rabindrasangeet in English by Rex Angeles is worth mentioning. The final program was a remarkable performance by Subha Kokubo of Indian Classical Dance Troupe, Nagoya. The program ended with the presenting of “Uttoriyo� to all invited artists by Swami Medhasananda-ji. Saraswati Puja on 30th January, 2010. 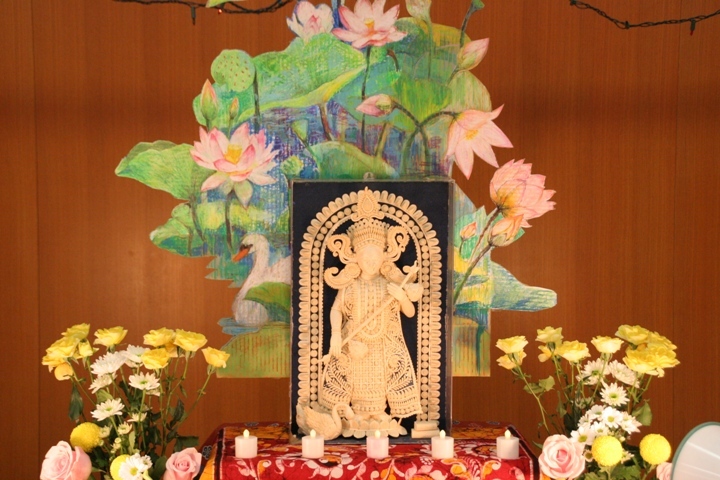 Saraswati Puja, this year was celebrated by BATJ on the 30th of January at the Ota Bunka no Mori hall in Tokyo. After the Puja was performed and Puspanjali offered, three tiny tots had their “Hate khori�E�Ewe wish them all success in their future. Lunch, catered by Priya restaurant, was followed by the cultural program. The program started with a piano recital by Keiko Chattopadhyay. This was followed by a Talent show by the children. Next was Antakshari conducted by Soma Choudhuri. We extend our sincere thanks to “Ambika Japan�E “Brastel�E “Priya Restaurant�E and “Spice Magic Calcutta�Efor sponsoring the Antakshari. Durga Puja on 2nd and 3rd October, 2009. 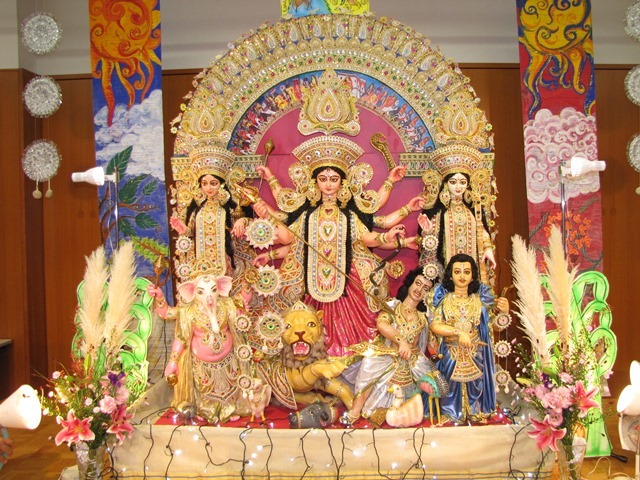 The 20th Tokyo Durga Puja organized by the Bengali Association of Tokyo, Japan was held on the 3rd of October, 2009. Early morning rain did not dampen the spirit of the enthusiastic participants who came from in and around Tokyo and also other prefectures. Our annual Puja publication “Anjali�Ewas published that day followed by Puja, performed by Sudeb Chattopadhyay, Anjali, prosad and Bhog. This year’s cultural program included Devi Vandana, a children’s play “Goopy Gyne Bagha Byne�E songs from Bangla Band by our very own boys, Bollywood songs by the ladies and a brilliant performance of Chhau Dance by the Seraikalla Chhau group, courtesy of the Indian Embassy. The day ended with evening Arti and sindur khela and dancing, followed by dinner. Rabindra Jayanti on 9th May, 2009. Every year, a Rabindra Jayanti program is organized by Tomoko Khambe-san in Tokyo. This year, it was the 27th year of her program in Tokyo. She is herself a reputed Rabindra-sangeet singer. She learnt from Shri Shantideb Ghosh at Shantiniketan. The program was held on May 9, 2009, Saturday from 1:30 PM to 4:00 PM at the Muja Kawasaki Symphony Hall. Like every year, BATJ members participated in this program. Saraswati Puja on 31st January, 2009. Saraswati Puja was celebrated by BATJ in Tokyo on the 31st Jan, 2009 with our community members joining in the invocation of the Goddess of learning led by Sudeb Chattopadhyay. After Anjali was offered, prosad was distributed followed by Lunch. The cultural programme started with songs by Samudra Datta Gupta and Shreyashi Mondol. Next was the children’s turn to show their talent. This year’s guest artist was Mr. Tim Hoffman and his group of Indo-Japan Music Exchange who performed a variety and some experimental music using Japanese instruments and Indian music.